Music downloaded to a computer must be transferred to the handset with Windows Media Player via USB cable. Place the handset in Sync Mode. Open Windows Media Player by selecting: Start > All Programs > Windows Media Player. With Windows 10, click Start > Apps icon (located in the top-left corner) > All apps (located in the bottom-left corner) > Windows Media Player. From the drop down list on the left, select the desired playlist or All Music. 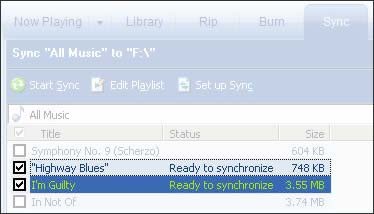 Select the songs to be synchronized. 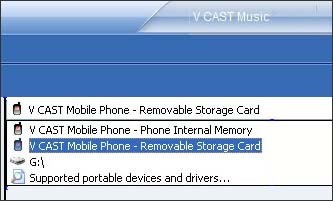 If the removable storage card is selected, the card must be in the phone. 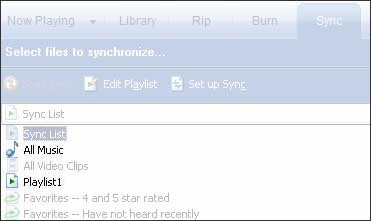 Click Start Sync to synchronize files.